Edgar Percival was born in Albury, New South Wales in 1898. Following service with the Royal Flying Corp during World War 1, Percival operated his own charter company in Australia before returning to England where he was appointed as an Air Ministry test pilot. His interest in aircraft design led him to form his own aircraft company at Gravesend, Kent in 1934. Percival’s aircraft were noted for their graceful lines and outstanding performance. Charles Kingsford Smith flew a Percival Gull Four named ‘Miss Southern Cross’ from England to Australia in the record breaking time of 7 days 4 hours and 44 minutes. 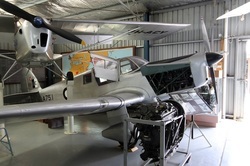 The New Zealand aviatrix, Jean Batten, also used the Percival Gull to fly from England to Australia in October 1936. The Proctor was the military communications version of the Gull. It was designed to carry four people in comfort and was powered by a 200 HP Gipsy Six engine. In the 1960’s the museum acquired the remains of several Proctors, which had been grounded due to doubts regarding the glue bonding of their wooden structures. Over a ten year period one aircraft was built from these remains.